Mobile is the biggest business news of the 21st century, Mary Meeker has been reporting from the frontlines for 15 years. Mobile is the biggest business news of the 21st century, and Mary Meeker has been reporting from the frontlines for 15 years. Here is my personal take on her 2015 Internet Trends report. For many years Mary Meeker has been a part of my professional life, particularly when I need to add context to conference presentations. Every year since the turn of the millennium, the virtual printing presses at Kleiner Perkins Caufield & Byers (KPCB) have flown into overdrive as millions of technology journalists, consultants, and other professionals pore over Mary’s gems of wise analysis. The annual release of her latest SlideShare deck is anticipated, digested, and regurgitated almost instantly. This year her Internet Trends Report was viewed over a million times within four days of being published. It’s easy to see why Mary’s report is so compelling. It’s epic in scope and detailed in execution. Her style is intelligent, transparent, with data-driven analysis. 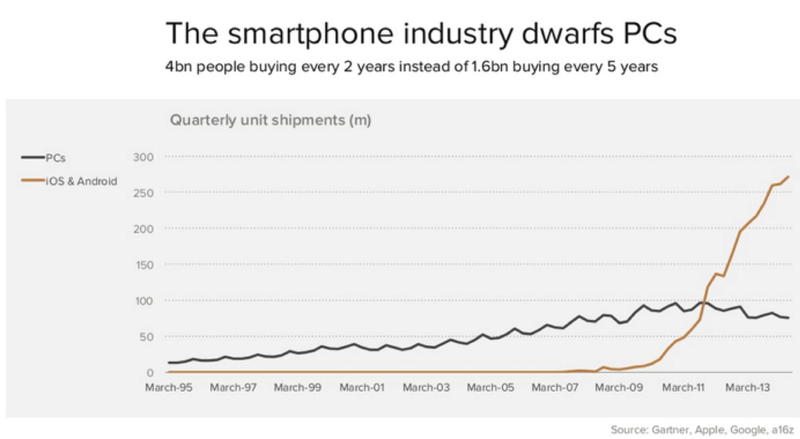 Mary’s report has consistently reflected the thunderous growth of humanity’s love of mobile phones. We are indeed evolving to a race christened by the Economist magazine as Phono-Sapiens. The rise of mobile device adoption, and our levels of mobile engagement, is illustrated by a J-Curve so steep it can look almost vertical. Naturally, this is big business. According to Benedict Evans, Global telecoms industry revenue amounts to around $275 for every person on earth. This makes Mary’s report imperative for anyone interested in business, no matter what the vertical. Mobile devices and mobile engagement are at the heart of a myriad of use cases, from media consumption to customer support, to ecommerce notifications and streamlining 3PL and BPO. 1. Mobile penetration is growing exponentially. In 1995 only 1% of the planet had a mobile phone, last year we reached 73% penetration. 2. Most people can’t see your app. Almost two-thirds of mobile connections are from feature phones, not smartphones. It’s worth letting that sink in. This means businesses really need to have a mobile engagement strategy (that includes SMS) before they have an app strategy. 3. Mobile advertising is not growing as fast as media consumption from mobile devices. This one I can relate to. I have never intentionally clicked on an advert on my mobile device. I would argue that the $25b opportunity in the US that is highlighted in the report is not a direct correlation to “advertising” on mobile. Interruption advertising doesn’t work on mobile devices; these are intensely personal portals of experience. However, consumers respond very positively to highly targeted mobile campaigns that are seen to offer genuine relevance and value. For example, I frequently redeem SMS vouchers sent from my local Pizza restaurant, respond to parcel delivery notifications, click push notifications about music I love from BandsInTown, and buy Hipstamatic refills when they are promoted. 4. Mobile advertising is evolving some interesting new formats. Google’s local inventory advertising is a forward-looking response to consumer behavior. If people are searching for products, it lists where they can find them nearby. This is a user-centric solution, a genuine value-add to the consumer; it also feels like the polar opposite of the noise of interruption advertising. 5. Mobile messaging is huge, but not as huge as SMS. Mobile messaging is dominating smartphone app use; over 6 of the Top 10 apps used globally are messaging apps. However OTT messaging is dwarfed by SMS use. There is movement towards joining the global ubiquity of SMS and the new functionality of OTT players, as Mary puts it “Messaging leaders aiming to create cross-platform operating systems that are context-persistent communications hubs for more & more services”. At OpenMarket we are collaborating with the innovative Matrix.org startup, which is doing exactly that by leveraging our Global SMS coverage with their uniquely interoperable open standard for persistent OTT communication. 8. New breeds of innovative services are arising from our mobile behaviour. From instant accommodation booking with AirB&B to frictionless urban transportation with Uber and Lyft, mobile devices will facilitate purchases which can be made from anywhere at any time. Specific growth is being observed in markets which are high spend and high engagement, and also markets which have a weak user experience. Online platforms are enabling steady growth in product commerce, and enabling rapid growth in service commerce. This flexible online marketplace comes with its own challenges, and a sometimes confusing regulatory landscape. 9. Millennials care about different things than their managers. “Meaningful work” is seen as the single most important indicator of career success for millennials. Will this lead to more people working in the non-profit sector, and with the technology companies that support them? 10. China and India are following the Internet user adoption curve of the USA. Mobile devices are driving Internet growth in India, particularly around ecommerce. 11. Diversity matters. A perfect way to end our Meeker data dive. I hope you agree that there is indeed something about Mary. I’ll certainly be quoting her stats, yet again, over the course of this year. What did you make of her 2015 presentation? Feel free to comment below, or drop me a line.